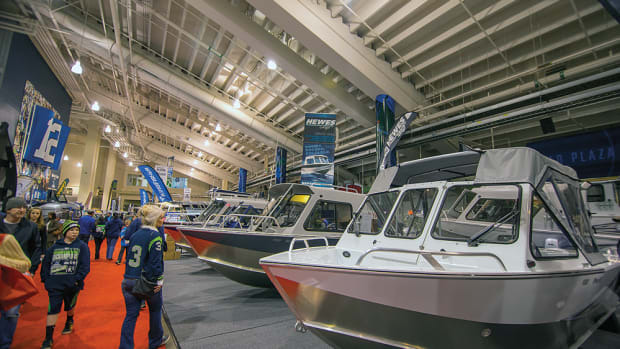 The Seattle Boat Show is the West Coast's largest boat show, featuring more than 1,000 recreational watercraft, seminars and the latest accessories indoors at CenturyLink Field and afloat on South Lake Union. The event is held annually in January. For the first time in its 71-year history, the Seattle Boat Show will be held at three locations — indoors at the CenturyLink Field Event Center and on the water at South Lake Union and the newly added Bell Harbor Marina. LH-Finance and the Northwest Marine Trade Association said they will launch a “VIP Experience” at the 2018 Seattle Boat Show. The Northwest Marine Trade Association is organizing a career fair at the 70th annual Seattle Boat Show. The 69th annual Seattle Boat Show wrapped up Feb. 6 with an increase in attendance of 1.4 percent from 2015. The Northwest Marine Trade Association held its second annual career fair at the Seattle Boat Show on Feb. 1. The Northwest Marine Trade Association is organizing a career fair at the Seattle Boat Show on Feb. 1. The Seattle Boat Show announced its seminar lineup, which includes 35 new topics, for the January show.